Searches on Google on some e-Learning related terms are dropping year by year: searches on Instructional design for example dropped by 80% since 2005. On SCORM the drop is 83%. Is this a decline in interest for e-Learning or is a signal for something else? 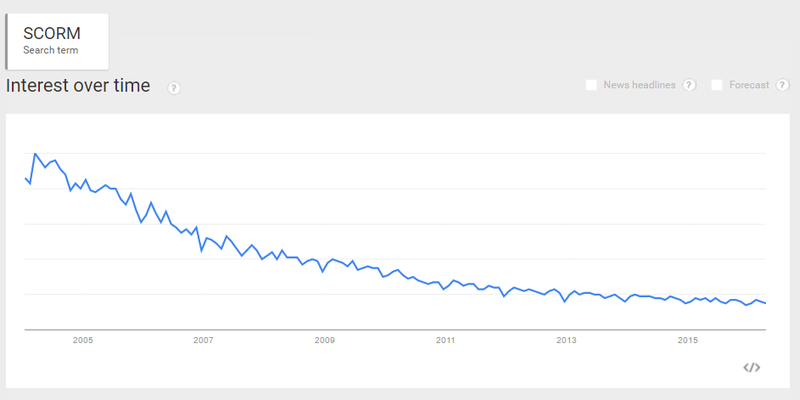 I do not believe it is a declining interest in e-Learning. The e-Learning market is over 50 billion and is growing with double digits each year. I do believe it is a signal of fundamental change. Terms connected to old school e-Learning are dropping, terms related to new forms of (e-)Learning (like MOOC’s) are rising in the Google trends. Let’s look at some specific keywords. Google trends shows a drop of 80% on searches on Instructional design in the past decade or so. It is a steady decline over the past decade. I do believe it is an indication of an important change that is taking place: People are doing it for themselves. We have seen similar developments in other industries. The launch of Desktop publishing programs in the eighties changed a whole industry. It switched from service to mainly software. A similar development occurs with video production. People will create their own video’s more often. For video there are two reasons. People are used to ‘home made’ quality thanks to sides like YouTube and Vimeo and you now always carry a device that can create video’s. These two reasons (accessibility and quality) apply to both examples. Technological developments make it possible for people to do it by themselves and at the same time they settle for lower quality. The same thing is now happening in e-Learning. e-Learning software like Easygenerator make it possible for everybody to create e-Learning without any prior knowledge. And yes the quality of the output will be less than a course designed by a specialist. But for many purposes this quality is sufficient. And thanks to the faster production time and lower cost e-Learning is now an option in many more use cases than it was 10 years ago. No it won’t. But it will only be useful (cost effective) in very high stake training. Training for safety for example, or compliance. But the general trend is that the main role of the instructional designer needs to change from designer to coach. Both terms are dropping in Google searches LMS by 50%, SCORM by over 80%. A very similar trend as with Instructional design. And this is a great thing. We all know that SCORM is outdated, an industry standard that over a decade old is a shame. Just imagine all developments of the past 10 years that are not supported. In my eyes most LMS are outdated as well. They should be learning systems but in fact they are management systems, they don’t facilitate the learner and they create vendor lock-in. Our world has changed because the learner has taken control, a learning management system can only survive if the change into a Learning Facilitating System. I presented on this topic (The death of the corporate LMS at DevLearn in 2014) and developments since then only strengthened my conviction. Not all e-Learning related terms are dropping. A term like MOOC has grown (although it is on the same level for 2 years now). There is also growing interest for XAPI and 70:20:10. These terms are all connected to e-Learning 2.0 and to the future of online learning. They are all representing concepts that have a meaningful application, it is an indication that the e-Learning industry is getting mature.